Love how quiet it is here. Ground are kept nice and clean people are all friendly. Staff is always ready to greet people and answer any questions. Great place to live. Hi Jim T., we are very happy to have provided you with such a positive experience! It has been great they truly have been working with us. They are truly nice with everything that we went through. I love this apartment complex. Luxery is a bit of an overreach but the apartments aren't bad and the people in the front office are nice. Since the front office change things have been running better. Hi Robert C., thank you so much for your positive comments about Promenade Boiling Springs! Very nice place to live, very close to school with tons of places to go around the area. Very friendly staff and reasonable maintenance time respondance. Hi Mckenzie P., thank you so much for your positive comments about Promenade Boiling Springs! I love the location. It's close to everything I find important! Great for single family's or large ones. Pet friendly is too. I would recommend it to anyone. Attended Wine Down Wednesday last week and had a great time. They had a variety of drinks, appetizers and snacks out. The best part was getting to talk to the ladies in the office on a more personal basis! Thanks and I look forward to the next one. Hi Tanya R., thank you so much for your positive comments about Promenade Boiling Springs! Please let us know if there is anything else we can do for you; we are more than happy to help! Janice C., thank you for your kind review; we are happy to pass along your comments to the team here at Promenade Boiling Springs! There are improvements that certainly could be made. The property itself is nice and is a great community for dogs. Communication between the office staff and maintenance is lacking. There is not a way to speak with maintenance directly, unless they reach out to you. Some common areas are ready for some spring cleaning. The office was expeditious in getting a problem with the dumpster area resolved, and this is greatly appreciated! I have been calling the Promenade home for nearly a year now, and I am so happy that I chose this community. I moved to this area from Florida to be near my family . I am a widow in my seventies and feel very safe here. I do have a suggestion it would be nice if you could arrange for residents to get together for card playing, or any other games. Hope this is something you could consider. Viv*@*.com, thank you for your kind review; we are happy to pass along your comments to the team here at Promenade Boiling Springs! Tge apartment complex is a nice place to live.It is quiet and close to town.It is also nice to be close to the highway.I am ready for summee so I can enjoy the swimming pool. Hi Kevin R., we are very happy to have provided you with such a positive experience! Overall the resident experience is a pleasant one. Everything is kept neat and clean. The architecture is beautiful and the quality of the apartments are amazing. The employees at the main office are always generous and amicable. They are also extremely helpful. Nice place to live. Quiet community with great people. I really like having an app for maintenance requests and rent payments. Convenient location. I love living at the Promenade! Hi Jennifer R., we are very happy to have provided you with such a positive experience! If you have any further questions, please give us a call. We're always happy to help! Becoming a resident has been an excellent experience. Staff is friendly and responsive. I love my apartment it was in excellent condition upon move in. Nancy B., we are so happy to read such a great review about Promenade Boiling Springs! I love our new home! The community seems to be very quiet which suits my needs perfectly and the staff is amazing! With any issue that comes up they are always friendly and fast to assist in any way possible. Hi Tasha S., we are very happy to have provided you with such a positive experience! If you ever need anything else from us, please feel free to give us a call or stop by. Have an awesome day! Office was very fast with fixing complaints and concerns. They were super friendly from the time we first walked in and extremely helpful throughout the application process. So far everything has been excellent! Great costumer service, fast communication, good environment, friendly people and community. Looking forward to the future! Hi Wilber V., thank you so much for your positive comments about Promenade Boiling Springs! We are always more than happy to assist you if anything else comes up. Take care! Living at boiling springs has been a great experience. The community is great, the office staff is amazing, maintenance staff is fast, we love it! Hi Maria S., we are very happy to have provided you with such a positive experience! If you have any further questions, please give us a call. We're always happy to help! So far, I am enjoying being a member in the community of, the Promenade. If I have a problem or say, the sink leaks. I tell the office about it and it normally gets fixed that day, or the next. Everyone that I have encountered here is nice, as well. Feels great and welcoming. Hi Stephanie H., we are very happy to have provided you with such a positive experience! If you ever need anything else from us, please feel free to give us a call or stop by. Have an awesome day! As you live out your days at the Promenade, one can enjoy its convenient location along with a great community. There’s plenty of space for friends and family to hangout outside, along with a nice pool to lounge in. However, some occupants find it hard to take care of pets and clean up after them, leaving some unwanted business outside. Overall, it’s a great place to live. Quiet, clean, convenient. Staff is very cordial so is the maintenance staff. Just a nice place to live. Grounds are kept extremely clean and groomed. Would recommend friends to check out the promenade. 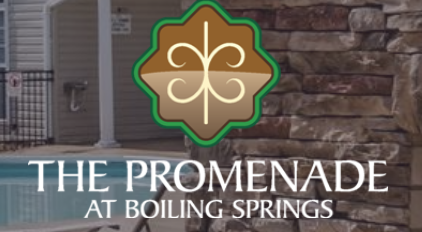 Marilyn M., we are so happy to read such a great review about Promenade Boiling Springs! If you ever need anything else from us, please feel free to give us a call or stop by. Have an awesome day! The staff, especially Nicki, has been very helpful as we are moving from Ohio to S.C. Thanks for making this a smooth move for us-we can't wait to get down south. Tanya R., thank you for your kind review; we are happy to pass along your comments to the team here at Promenade Boiling Springs! The apartments themselves are a bit outdated, with a fairly small kitchen, but the location and amenities are nice. The staff is incredibly friendly, and the neighborhood is every well taken care of. Hi Tyler V., thank you so much for your positive comments about Promenade Boiling Springs! Please let us know if there is anything else we can do for you; we are more than happy to help! Great community so far, very good at getting back in touch with you if any issues and fixing it I’ve only been here for about 15 days but no complaints so far besides the cleaners could have cleaned better when I moved in. Zachary M., we are so happy to read such a great review about Promenade Boiling Springs! Thanks again for taking the time to leave us this information about your recent visit. Take care! Had a couple maintenance issues. AC took longer than they told me. Dishwasher still isn’t fixed but other than that I enjoy living there. Would recommend.